This entry was posted in Fireplaces on April 9, 2019 by The Original Flame Author. So.. you have decided to put a fireplace in your home? But you don’t not know how to go about it? No worries! We are here to help you out! A fireplace is a great element to add in your home. It not only gives you heat and warmth but also adds a visual appeal to your home. The entire process of getting a fireplace and having it installed may seem to be an overwhelming task but is actually a very simple thing. The key is to know what exactly you want. This is why we suggest that you contact a dealer of Fireplaces in Peterborough right away! A dealer will be able to guide you through the entire process and help you in selecting the perfect fireplace for your home. Once you get in touch with a fireplace dealer, the entire process will become as easy as 1, 2, 3 and 4, covered in four extremely simple things. The dealers of fireplaces in Peterborough are experienced in their trade and know fireplaces in and out. They will be able to give your important information about all the steps and provide you with customization options too. Now that you know how to begin your fireplace journey, let us discuss the four steps in detail to help you get a clear idea. The first and foremost thing that needs to be done is selecting a fireplace. There are different types of fireplaces available, each featuring different technologies and having a separate set of advantages. What you must keep in mind that each fireplace is suited for a specific purpose! While some fireplaces in Peterborough homes are great for heating the large space, others might create a perfect ambiance with a smaller amount of heat. Wood fireplaces – Wood fireplaces are perfect if you want to really enjoy a warm fire. They create the perfect ambiance with the crackling of the logs and the dancing bright flames. They also keep the house warm in the event of a power outage. The modern fireplaces are highly efficient, heating your home with low emissions. Gas Fireplaces – Gas fireplaces are a perfect choice if you hate chopping and hauling wood. They offer the beauty of the fire and offer convenient operation, with a remote control or a wall thermostat. They are also able to keep the house warm during a power outage. Electric Fireplaces – Electric fireplaces create a great ambiance, without producing too much heat. They give you the flexibility to have the flames burning without using the heater. This means that you can use it to create a great ambiance throughout the year. Also, they are super easy to install. You can plug in to start the fire. Ethanol Fireplaces – Ethanol is an eco-friendly fuel as it does not produce any smoke or smell. 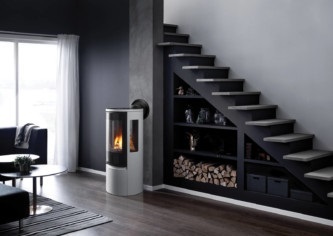 This also means that an ethanol fireplace does not need a chimney. It has a real flickering flame and provides easy heat. If you are looking for a contemporary fireplace, this has to be your choice! Do you want real flames or just the ambiance? Wish to have warmth as well as the convenience of use? Do you have limitations of space? Based on these questions, you will be able to make an appropriate decision. If you provide them with the above information, your fireplace dealer will be able to offer you some great options. Step 2: Design – So now you know what kind of fireplace you want. Next, you would want to consider its design and style as it will be somewhat the focal point of your living room. You will also have to ensure that the style of the fireplace seamlessly blends in with the style of the room. Thus, you could choose from traditional, classic, rustic, contemporary and modern fireplaces. You could also consider a stand-alone or a corner fireplace. When it comes to fireplace design, there are endless possibilities. Your dealer will also help you with the design and customization as needed. Step 3: Installation – If you feel that you are happy with the choice of the fireplace and the design idea, there is no reason to delay the purchase of the fireplace. When you visit your fireplace dealer for the purchase, you should also ask them about its installation. Authorized dealers of fireplaces in Peterborough have certified installation technicians on their team. Never attempt to install the fireplace on your own as it could hamper your safety and the functionality of the fireplace. Getting it done by professional installers will ensure safety, efficiency and the process will be over quickly too. Step 4: Enjoy – Now that you have done all the hard work and the installation technician has also done his part, your new fireplace is ready to be used. Simply light the fire and enjoy the dancing flames and the glowing warmth. You will surely receive a ton of compliments for the beauty that the fireplace adds to your room! However, you must not forget to take proper care and maintain the fireplace. Schedule sweeping and cleaning of the chimney from time to time and regular inspections too! So, this was a brief description of the process of selecting fireplaces in Peterborough. Choose a fireplace wisely so that you can enjoy both, the fire and peace of mind! We at The Original Flame are authorized dealers of fireplaces from renowned and trusted manufacturers. If you want any help regarding a fireplace, feel free to drop by!